We recently purchased some of these lovely Italian biscuits, Tuscan delicacy before anyone says anything. Beautiful to look at and eat. I then realised that they are almost £1 each! I said to my wife thats outrageous, she then proclaimed that almonds are an expensive nut! You can tell who does the shopping in my house. Hence I love to put my money where my mouth is and hey presto. Easiest biscuits in the world to make, cost 15p per biscuit! I know fuel is expensive these days. These would make an excellent xmas present if they last that long. Follow the basic recipe then change it up a bit. I’m going to make some rose water and orange biscuits. Plus some hazelnut based ones. Sift icing sugar to egg whites followed by adding all the ingredients. Gently fold everything together. Leave for four hours to stiffen up. After this, dust a surface with icing sugar. Roll the mix gently into a large log and cut pieces at 5-6mm intervals. Put cut side up on baking paper, dust with icing sugar and bake at 160°C for 18-19 minutes. They will be very soft when they come out of the oven. They will harden up and then release cleanly. I recently purchased some keto buns that were 4 for $10 and I immediately tried to deconstruct them. Almond meal is expensive here too but still cheaper than buying the buns (mine worked out to $12 for 8 buns. 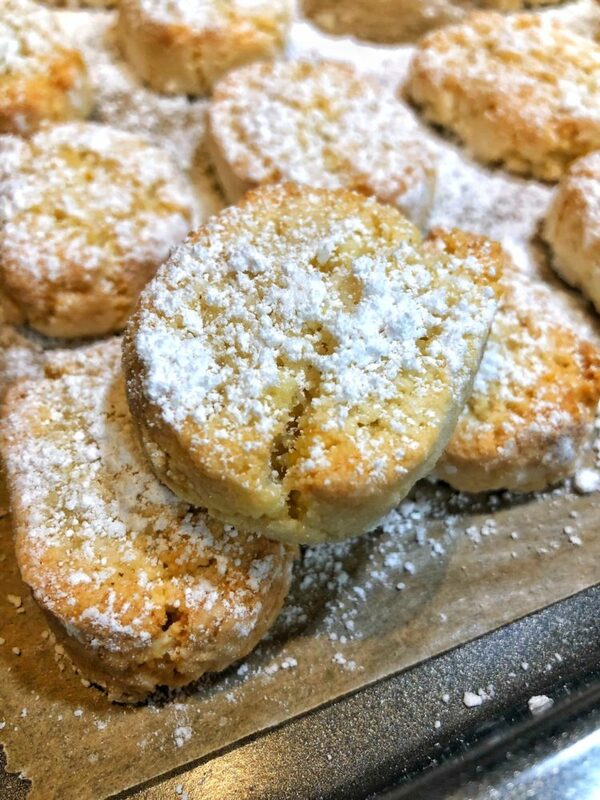 Your biscuits are beautiful, I just love a simple recipe like that. Feel free to send some our way. Might send you some of my lavender shortbread instead. Although I could send you both and then you can tell which ones are better.